Being flooded is a horrible experience. Filthy brown water devastates the ground floor of your house and insurance claims can run into tens of thousands of pounds. For low level floods, the FloodMate kit can help reduce your risk of flooding and improve your flood response. 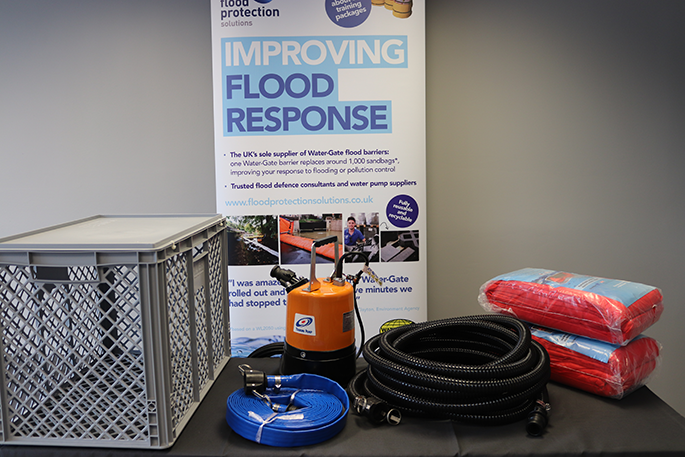 Water pumps are essential in flood defence and the FloodMate kit has been designed to give an added level of protection above just having a water pump. Pictured above: Floodmate 2 with LSC1.4S. What is a FloodMate kit? The FloodMate includes a range of items, provided together in a kit for an emergency flooding situation. The case has room for you to keep other items that will come in handy if ever required for flood protection, such as emergency meals, a head torch, or grab bags. 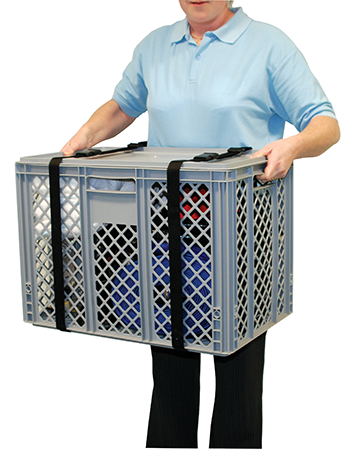 What is included in the FloodMate? The FloodMate kit includes a water pump, hose, connectors, and Hydrosacks. There are 4 different FloodMate options, each with a different water pump. The kits include Hydrosacks, which are designed to be strategically placed to divert water or protect from low level floods, where water might be able to seep through. As you can see in the picture below. In flood defence, time is of the essence. 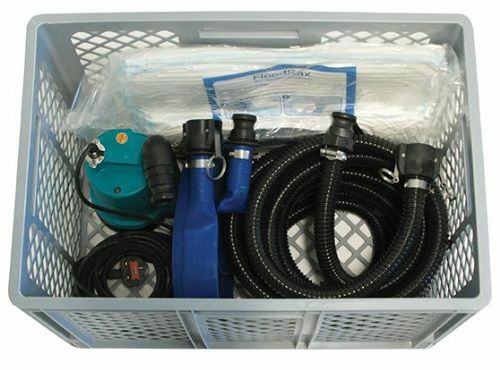 These kits have taken this into account and include quick connectors with a lightweight hose so that they can be used or deployed quickly and easily, whilst also being convenient to store. There can be so many different causes of flooding, many that you may not be aware of until it’s too late. It is not just severe rain that is a cause as many people think. It can be anything from burst water mains, blocked drainage, overflowing stream or rivers, or even groundwater flooding from the natural water table of your land etc. Problem water may be able to enter your home or property through basements, doorways, backed up drains etc. 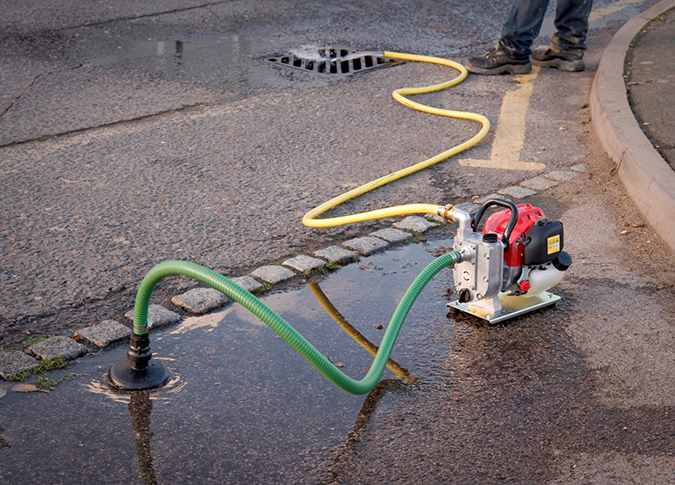 If your garden is flooding and the water level is rising up against your door you simply place the water pump in to the flood area, to make this easier you are supplied with a specialised delivery hose that has an integrated coil to ensure the hose does not kink or compress and cause the flow of water to stop. This allows you to remove the trouble water to the nearest safe location. The Hydrosacks could be used to divert water or protect against low level flooding. There are two different types of pumps that are available with the FloodMate kits. This is to help against a wider range of flooding issues that you may have. You can select either a submersible or engine driven pump depending what kit you choose. The engine driven pumps can be used where there is no power supply available. As these run on petrol they can be used in isolated locations and would be placed near to the problem water and not directly in to it. These are not to be used indoors as they emit exhaust fumes. Should you require any further advice please do not hesitate to contact us. As one of the UK’s leading flood defence companies, we also have award winning expert flood specialists on hand to help. We can provide site visits and consultancy to help you reduce your flood risk.